When you don’t have time to do it yourself, use our collection of wedding animations, backgrounds and animated titles to easily add that special touch of elegance and style to your next wedding video. Dazzle your clients with creative options and set yourself apart from the competition. Imaginative choices that will have them talking about you all over town. 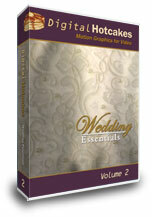 Here’s the best from Wedding Essentials volumes 1-4 rendered in beautiful full HD resolution. 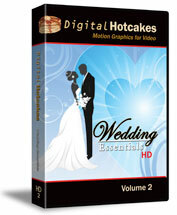 Enhance your HD wedding videos with these contemporary wedding graphics sets that include video backgrounds, lowerthirds, overlays, and transitions. Add a fresh style to your HD wedding videos with these wedding graphics sets that include video backgrounds, lowerthirds, overlays, and transitions. Set yourself apart. Easily add that special touch of elegance and style to your next wedding video with these wedding video backgrounds, transitions, and overlay. Standard DV only. Give the bride her colors. 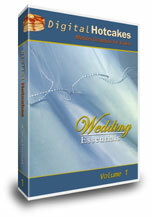 With 15 different color sets, each containing a lace, drape, folds, and lower-third animation. Standard DV only. 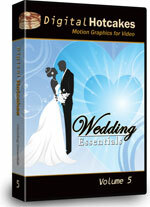 Impress your clients with contemporary wedding video graphics sets. Each set contains video backgrounds, lowerthirds, overlays, motion design elements, and transition wipes. Standard & widescreen DV resolutions. Save time from start to finish. Here’s the beginning and ending to your next wedding video. 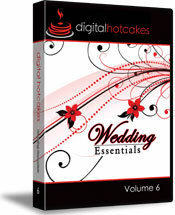 Contains intros and outros, creative transitions, video backgrounds, and stunning overlays. Standard DV only. 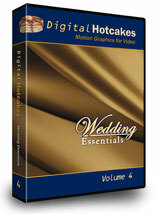 Wow your clients with modern flourish wedding video graphics sets. Each set contains video backgrounds, lowerthirds, overlays, motion design elements, and transition wipes. Standard & widescreen DV resolutions.